Ever felt irritated by the outrageous number of junk emails spamming your account? When you would open up your inbox to view potential important mails, but instead come across fake princes asking for money, and brands sending click baits? We all have been there. But the Kaspersky lab, a cybersecurity company, has a good news for us! 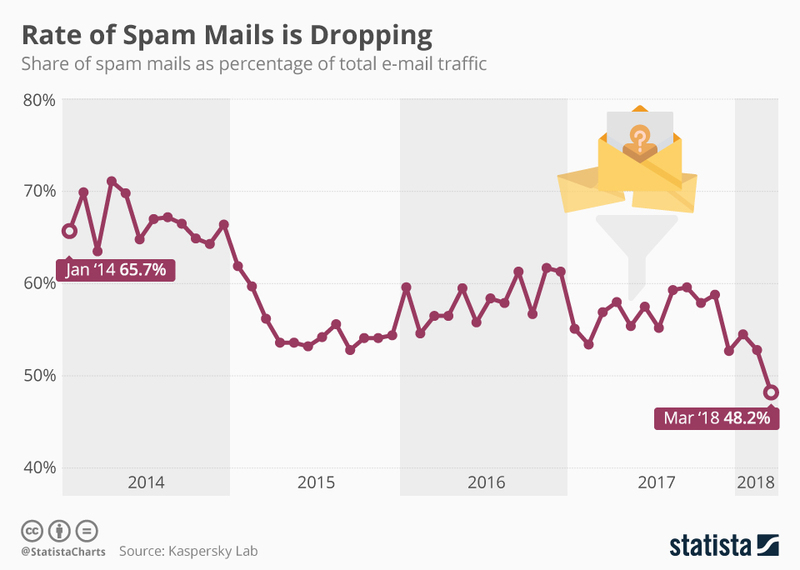 Apparently, according to a research it conducted, instances of spam mails has decreased significantly since the year 2014. Four years ago, 2/3rd of all the mails sent were in fact uselessjunk spams. However, today, the number has decreased significantly, and stands at 1/2 of all the emails belong to the aforementioned category. Kaspersky also reported that the United States was the world's biggest hub for spam mails, constituting 13.21 percent of all the unwanted messages. For more insights, take a peek at the infographic below.